Hello there lovely blog reader. Thanks for stopping by my blog. Today I am back to share a rather fun card with you, somewhat inspired by my fellow demonstrator and Tasmanian friend Kim Oliver. She shared a lovely card last week using watercolours and the beautiful Petal Passion Embossing Folders and I just had to give it a go using the Brusho Crystal Colours. I am a bit in love with the rich reds, yellows and oranges in the beautiful Brusho colours and I just love the beautiful colour bursts that it achieves. My Dad actually rang me and asked me to make a card for my Mum for him to give to her for their 32nd wedding anniversary today and so I gladly obliged (after all I am the only card maker in the family!) and got to work with the Petal Passion suite of products. This suite is one of the first things I ordered from the new Occasions catalogue from Onstage when I attended back in November and I had not really yet used it so I got to work! I love the look that the beautiful black and white gives the rich warm colours in the Brusho. 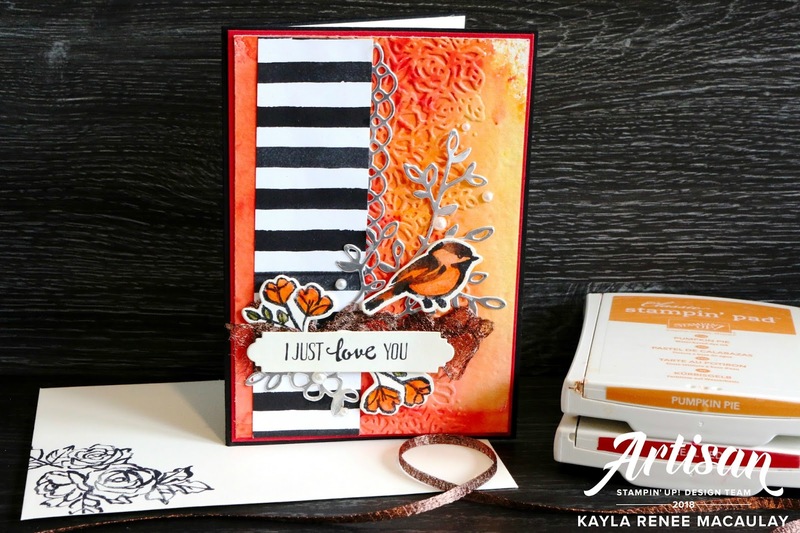 I emulated this with the Pumpkin Pie and Real Red Watercolour pencils when I created some flowers and a gorgeous bird stamped from the Petal Palette stamp set which I stamped on Thick Vanilla A4 card. 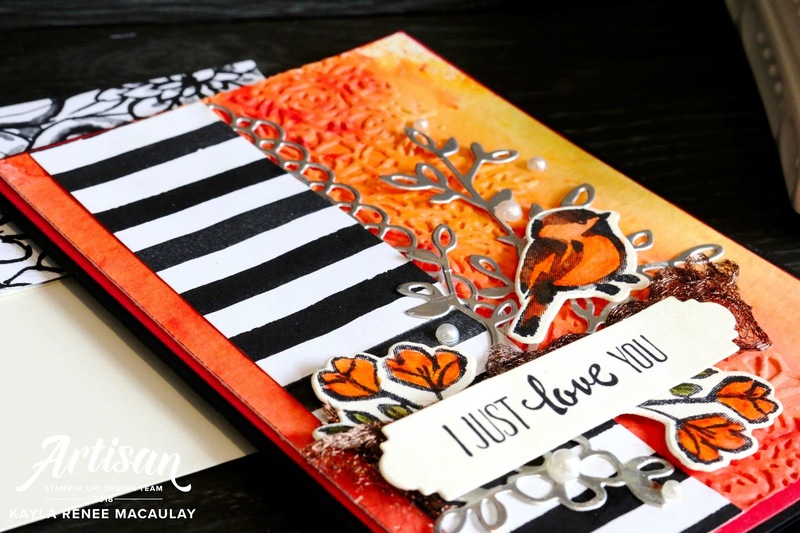 The background itself is Watercolour paper which is coloured with Brusho Crystal Colours, heat set and then dry embossed with the coordinating embossing folders. I actually watercolored these directly with a Clear Wink of Stella pen. I love doing this as it creates such a beautiful shimmery effect! You can't really tell in the photo but it has lots of shimmer and shine! I cut some silver accents with the Silver Foil using the Petals & More Thinlets Dies and layered then behind my main elements of my card. I never really use silver so it was a nice challenge I set for myself! Here's a little look at the inside of the card. 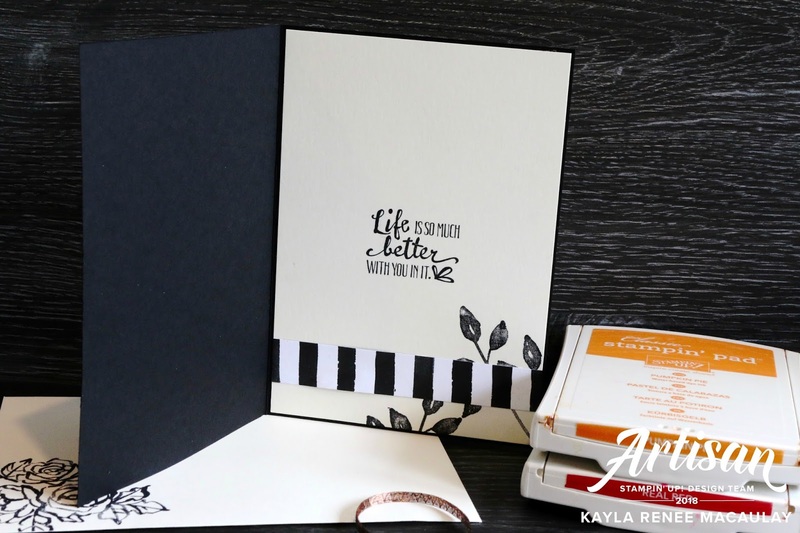 I always love to decorate the inside and here I placed a coordinating sentiment, some leaves stamped from the stamp set and a strip of the coordinating Designer Series Paper. I love how it turned out in the end and I really hope that my Mum will like it. I have finished it off with some gorgeous Copper Trim (which separates to act like netting so beautifully) and added some beautiful Pearls. I hope you liked seeing this simple anniversary card that I put together and it has inspired you to give the Petal Passion suite a try and grab out those Brusho Crystal Colours...they are so addictive once you get going!